I was inspired by The 524 Project where students utilized mobile learning as a way of connecting, expressing and performing their personal experiences by allowing students to create positive and honest messages about their experiences as youth in Detroit and Washington. Check out The 524 Project tumblr! What is Multimedia Theatre and Performance? Multimedia Performance is a combination of live performance that incorporates different media such as video and audio recordings, projections, and other forms of performance content for an audience. This can be a great way to have secondary students explore curriculum outcomes related to playwriting, directing, technical theatre and elements of design. What apps are available to help students start creating their own multimedia performance? Woices is a free audio guide service that also connects to a location. The app is available for Apple, Android, and Blackberry devices and can also be accessed online. Students can record stories and link them to a geographical location or pathway, use a map to help guide the audience through a story linked to specific places. If students are focusing on how to convey meaning through the setting of a performance, this would be a useful tool to help link an auditory story to a physical space. 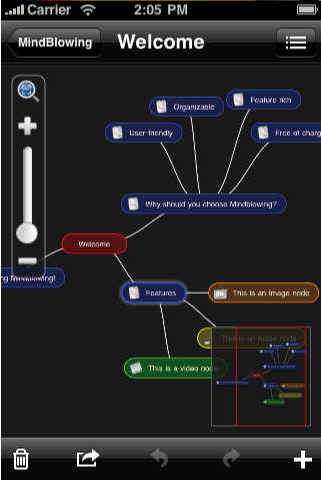 MindBlowing is a free mind mapping app available for Apple devices. 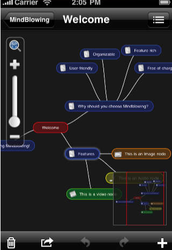 Students are able to upload images, audio files, and video to their mind map. This is a great way to get students brainstorming and doing pre-writing before when they are in the brainstorming phase of creating their narrative. This app can be a way for students to collect their rehearsal work so that they can access it in the further stages of developing their multimedia project. Ladibug is Chrome app that helps users capture, share, edit and annotate images. It is an excellent way to have students incorporate visual images for a multimedia performance. They can easily share their images with other users making collaborative group work much easier as well as providing an audience for the images created by the students. WeVideo is a free Chrome app that assists users in creating and editing videos. Students are able to collect and select images, video and audio to create a story. This app also allows for collaboration amongst students and can be shared through Google Drive or WeVideo. This is an easy way for students to prepare audio and visual elements to enhance their multimedia performance. Fotobabble is an app that helps users create narration for an image. It is available for free online and also for Apple iPhone, iPod touch, and iPad. You can create a narrated slideshow or single image. Students can use the prerecorded narration and images in a multimedia performance to supplement live action or stand alone.